The Bachelor of Science in Radiologic Sciences at Cambridge College of Healthcare & Technology/Cambridge Institute of Allied Health & Technology is a bridge program designed to help currently licensed Radiologic Technologists with Associate-level degrees further their careers. Offered completely online, the radiography program offers a choice of two tracks—healthcare and education, with each geared specifically toward students’ future career goals. Cambridge College of Healthcare & Technology is focused on the success of every student. Every member of the staff is committed to facilitating a safe and enjoyable learning environment, and to guiding students through the process of advancing education. Work/life/school balance: Our online Bachelor of Science in Radiography Sciences program has been carefully designed for the working healthcare professional. Study and learn from work, home or wherever you do it best, without sacrificing hours with your family or at your job. Personal attention: We believe in our role as advisors and supporters. To meet the responsibilities of these vital roles, we are here to provide the advice and guidance you need to succeed in your education. Focused learning: The online Bachelor of Science in Radiologic Sciences coursework has been developed with help from experienced professionals and employers. The program’s coursework is focused solely on the topics you’ll need to succeed as a Radiologic Technologist. 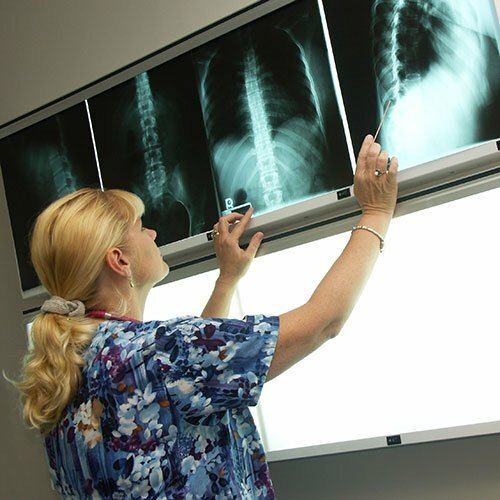 According to the U.S. Department of Labor, employment of radiologic technologists is projected to increase nearly 10 percent between 2014 and 2024. That projected growth ranks higher than the average for all occupations. Growth in the radiologic technologist job market is largely due to the aging population’s advancing health needs, and the retirement of currently employed technologists. Individuals qualified for radiologic technologist roles have many opportunities for employment within hospitals, clinics, outpatient care facilities and more. Radiologic technologists are skilled medical professionals whose main focus includes providing radiation therapy and taking diagnostic images. Working with nurses, physicians and medical care specialists, radiologic technologists use x-ray imaging equipment to capture images of the body for use in the diagnostic and care processes. Obtaining certification in one or more of these specializations improves employability and earning potential. You will receive a Bachelor of Science degree upon successful completion of this online program. * 75 semester credits will be awarded for satisfactory completion of a Radiology Technology associate education program, for unrestricted licensure as a ARRT (R) , and for demonstration of admission requirement of successful completion of 21 semester credits (or equivalent) of general education courses and required pre-requisite courses. Examine health care policies, finance, and the regulatory requirements of the profession.